Published July 31, 2018 By Anna T. This post may contain affiliate links. Regardless, I only recommend sites I've researched and/or used and trust. 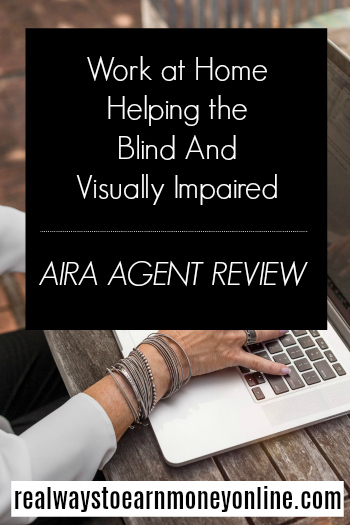 Aira are the creators of a new service for helping the blind and visually impaired navigate their day-to-day lives. Their innovative software works through special glasses equipped with a digital camera, and connected to a special smartphone app. The company hires home-based agents in the United States who help customers accomplish tasks that would otherwise be very difficult. As an Aira agent, you will work from home on your computer as an independent contractor. The special glasses given to clients have a button on the earpiece that can be used to request the assistance of an agent. Upon reception of such a request, the agent will initiate a voice chat with the client, and use the provided interface to help the individual deal with whatever problem he or she may have encountered. The web interface for agents offers a live video feed from the client's glasses, as well as GPS information, and access to the client's profile. The client's profile includes all sorts of useful data such as their favorite foods and pictures of all the people they know, enabling agents to help them spot a particular person in a crowded place. The job is fairly complex. As an agent, you never know what you might have to help a client deal with. For example, you may need to guide someone through an airport, help them find a location, or assist them while they shop for groceries. Agents are basically serving as a virtual set of eyes, which means they have a huge responsibility, and must maintain a high level of professionalism at all times. Strong people skills, attention to detail, and an ability to multitask are all very important for this job. Every single call will present you with a completely different challenge. You'll need to be flexible, patient,and exceptionally quick on your feet. Aira are a bit closed mouthed about how much they pay, and the company is so new that it's hard to gather much information from former workers. In my research I was able to dig up a few mentions of outdated job postings suggesting agents earned $15.00 an hour. Newer postings don't list a rate at all. It may still be the same, or it may not. The company's operating hours are currently 4 am to 10 pm Pacific time, but they're supposed to switch to 24 hours a day sometime in the near future. Aira currently has 24/7 operating hours! Scheduling for agents is described as flexible but Aira doesn't go into any detail about the extent of that flexibility. In practice, “flexible” could mean a lot of different things. Maybe it means that you log in and work whenever you want, or maybe you're able to choose which shifts are most comfortable for you. Aira is looking for people with 2 years of previous customer service experience, and at least a high school education with some college preferred. Previous experience working with the blind and military experience are big assets, but not required. The job involves constant real-time voice communication, so you'll definitely need a quiet place to work where you won't be interrupted. If you want practice doing this sort of work and are willing to be an unpaid volunteer for a different company, Be My Eyes offers a similar service and they are usually looking for volunteers. To sign up, you simply go to their website and answer a few questions on a form. If you fit the profile they're looking for, you'll be given an aptitude test. Assuming you make it past the aptitude test, the next steps are an interview, and a background check. Training is handled over the internet with a series of online classes using a video interface. You'll work through several training modules, and then eventually you'll work with a trainer who's blind, helping him or her with simulated tasks. To finish things off, you'll be paired with another agent who will watch and help you through your first few live sessions. Unfortunately, because this is a very new company, there are very few real life accounts out there on the web from former or current Aira agents. I checked all the usual places for worker reviews and found very little on Indeed.com. One person seemed somewhat disappointed by the pay, and the lack of upward mobility, but otherwise enjoyed the work. If you like the idea of helping people, and want to get in on the ground floor of an innovative new company, head on over to Aira's website and put in an application. Get a membership to FlexJobs, the most trusted job board with flexible and remote work that is guaranteed to be scam-free. Get 30 percent off a membership with promo code AFFILPROMO. I've been a member here myself for years and have discovered many good work at home companies thanks to my membership.